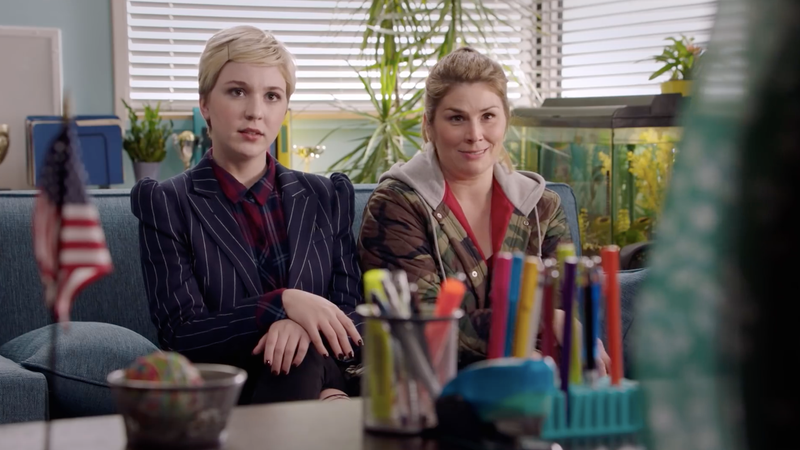 Cozi Zuehlsdorff and Heidi Blickenstaff star in the newest version of body-swap comedy Freaky Friday. Into every generation since 1973, an adaptation of Mary Rodgers’ novel Freaky Friday has been born, and it has become an important part of young people learning through pop culture that their parents are screw-ups just like they are. Disney’s latest incarnation of the story—a made-for-TV musical based on the studio’s recent Freaky Friday touring show—draws much of its inspiration from Rodgers’ original story about a mother and daughter who gain a better appreciation for each other after they magically switch bodies. Of course, the film makes all of the same jokes and hits the beats we’ve come to expect from Freaky Friday stories. Teen Ellie (Cozi Zuehlsdorff) is horrified to find herself stuck with her mother’s adult skin and hands while Katherine (Heidi Blickenstaff) is dismayed to learn that her daughter isn’t exactly living up to her high expectations. A parent and child who can’t see eye to eye and also have to pretend to be one another? How zany! The general lack of deviation from Rodgers’ original plot is a large part of what’s made the Freaky Friday adaptations such a fixture in people’s pop cultural consciousness. Regardless of whether you’re watching the 1976 movie starring a young Jodie Foster, the 2003 reboot with Jamie Lee Curtis and Lindsay Lohan, the animated homage featuring Wolverine and Spider-Man, or even Lil Dicky and Chris Brown’s “Freaky Friday” music video from a few months back, you know what you’re in for and the message that’s trying to be conveyed. But the consistent plotting that’s always made Freaky Friday feel so familiar is also beginning to make reboots like the latest come across as dated and kind of small-minded about teenagers’ abilities to navigate the world. The Disney Channel’s “kid-friendly” world, where teenagers’ greatest challenges amount to passing midterms and getting through complicated dance numbers, exist in stark contrast to things like the CW’s Riverdale, a series that give its young characters decidedly more complicated and mature plots to deal with. The reason for this difference is obvious—the Disney Channel and the CW are at opposite ends of a spectrum, playing to two completely different audiences. But if you think back on what it was like being a teenager, the reality of their lives lies somewhere between what the networks are broadcasting. While Freaky Friday’s core idea about how young kids and adults could stand to better appreciate the respective difficulties they’re faced with on a day to day basis is solid, the way that the most recent film handles its leads just feels boring—especially when you take into account what kind of lives teens lead in 2018. Recent films like Bo Burnham’s Eighth Grade unpack the intricacies of adolescent social dynamics the adult characters in Freaky Friday stories are meant to be confronted with, but seldom are in an interesting way. More and more, young(er) people are becoming active and engaged with the steering of our social and political discourse thanks in large part to their savvy with digital communications. It’ll be a cold day in hell before Disney greenlights a Freaky Friday adaptation where a parent discovers that their child has become a digital activist in the fight for comprehensive gun reform (can you imagine?). But the fact that that’s a reality of many young people’s lives today is all the more reason that a modern day Freaky Friday should feel comfortable delving into things about its characters that previous versions didn’t or perhaps couldn’t. There’s so much more between people and their parents than the “gosh, we’re so different, but also very similar” dynamic that Freaky Friday’s premise is tailor-made to explore. In order to really do that, though, Disney’s going to have to come around to the idea of truly reimagining Freaky Friday’s formula.